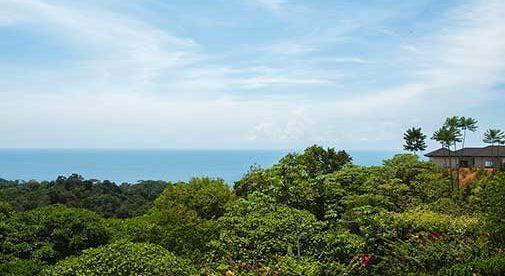 “On a clear day you can see all the way to Guanacaste province,” says Overton Pratt when he describes the view from his home in Ojochal, Costa Rica. In 2015 the couple revisited to ascertain whether or not they still felt the same way. After staying at a timeshare in the mountains above San José, they moved south to the Dominical/Uvita/Ojochal area. It was here that their decision was made. They loved the warmer Southern Zone, especially the area “where the mountains meet the sea” as it is known. While renting a house in Dominical they began their permanent house search. “The house we bought was a sort of fluke as it was listed above our price range,” says Overton. But the real estate agent persisted as the owners of the property were anxious to sell. The Pratts viewed it, and fell in love with both the house and the area. They paid $390,000 for the three-bedroom property which has three bathrooms, a media room, and a beautifully designed swimming pool. It also sits on a 0.67-acre property which has a great view of the Whale’s Tail—a giant rock that juts out into the southern Pacific Ocean. Curiously, not only has it got the distinct shape of the tail of a whale but it’s also the exact spot where hundreds of humpback whales congregate each year. The Pratts love their relaxed, outdoor lifestyle in Ojochal. The couple truly love their retirement home and have made many friends in the surrounding area, both expats and Ticos. Ojochal is known for its plethora of ethnic restaurants and is often called the culinary capital of Costa Rica. There are three lovely pristine sandy beaches in the area and the jungle is alive with toucans, monkeys, and other jungle flora and fauna. There is also a new hospital nearby and an international school. Since retiring, Overton has been able to indulge his passion for snakes and other reptiles. He runs a website on snake identification in Costa Rica to assist those interested in identifying snakes there, as well as in Panama and Nicaragua. With assistance from a friend, this has developed into Costa Rica Wildlife which identifies all species of animals and insects in Costa Rica. Michelle also indulges her passions. Having had an interest in gardening all her life, she has created many botanical gardens throughout Arizona and Idaho. Overton explains proudly, “Now living in Costa Rica with its perfect weather, she has created medicinal and culinary herbal gardens to compliment our property.” Their yard is a stunning showplace of lush shrubs, trees, and blossoms.